Now, new research from Washington University in St. Louis links the river’s increasingly deadly floods to a widespread pattern of human-caused environmental degradation and related flood-mitigation efforts that began changing the river’s natural flow nearly 3,000 years ago. “Human intervention in the Chinese environment is relatively massive, remarkably early and nowhere more keenly witnessed than in attempts to harness the Yellow River,” said T.R. Kidder, PhD, lead author of the study and an archaeologist at Washington University. 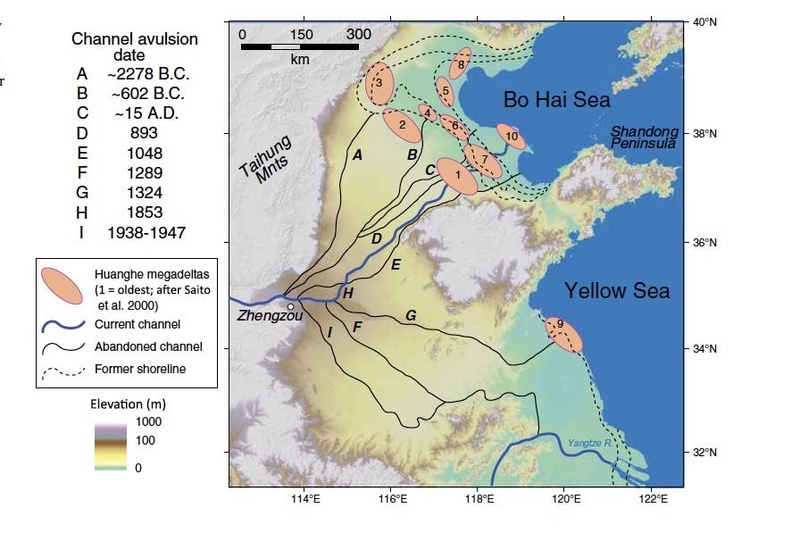 Forthcoming in the Journal of Archaeological and Anthropological Sciences, the study offers the earliest known archaeological evidence for human construction of large-scale levees and other flood-control systems in China. It also suggests that the Chinese government’s long-running efforts to tame the Yellow River with levees, dikes and drainage ditches actually made periodic flooding much worse, setting the stage for a catastrophic flood circa A.D. 14-17, which likely killed millions and triggered the collapse of the Western Han Dynasty. 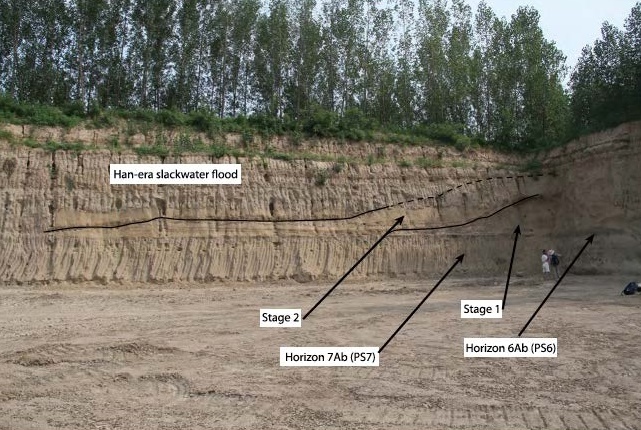 Kidder’s research, co-authored with Liu Haiwang, senior researcher at China’s Henan Provincial Institute of Cultural Relics and Archaeology, relies on a sophisticated analysis of sedimentary soils deposited along the Yellow River over thousands of years. It includes data from the team’s ongoing excavations at the sites of two ancient communities in the lower Yellow River flood plain of China’s Henan province. The Sanyangzhuang site, known today as “China’s Pompeii,” was slowly buried beneath five meters of sediment during a massive flood circa A.D. 14–17, leading to exceptional preservation of its buildings, fields, roads and wells. The Anshang site, discovered in 2012, includes the remains of a human-constructed levee and three irrigation/drainage ditches dating to the Zhou Dynasty (c. 1046–256 BC). 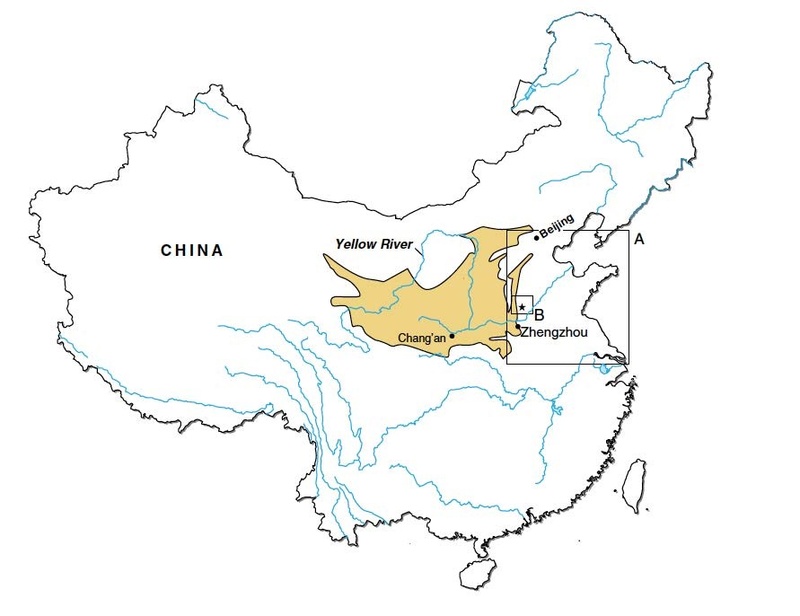 Locator Map: The Yellow River Vallley of China, with Box A identifying the flood plain regions researched in this study.The star in Box B is the location of the Anshang and Sanyangzhuang sites. The approximate extent of the Loess Plateau is indicated by shading. Researchers examined about 50 vertical feet of exposed soil layers at the Anshang site, carefully cleaning sections of a quarry wall to reveal patterns of sedimentary deposits dating back about 10,000 years. Nearly a third of this 10,000-year cross-section has been deposited in the last 2,000 years, indicating that the rate of deposit has steadily increased at a pace that mirrors the expansion of human activity in the region. While ancient levees may be difficult to spot with an untrained eye, geoarchaeologists employ an array of precise analytic tools to confirm a site’s sedimentary history. Soil layers are identified by coloration and tested for physical and chemical alterations linked to human activity. Timeframes are identified through radiocarbon dating of freshwater snail shells and other organic soil matter. Kidder’s research suggests the Chinese began building drainage/irrigation canals and bank/levee systems along the lower reaches of the Yellow River about 2,900–2,700 years ago. By the beginning of the first millennium A.D., the levee system had been extended much farther up river, lining the banks for several hundred miles, he estimated. The southwest corner of the brick quarry dig site at Anshang shows remnants of the bank/levee in the sedimentary record. The levees were built in part because of increasing erosion upstream, which was caused by more intensive agriculture and the expansion of the growing Chinese civilization. The sedimentary record shows a vicious cycle of primitive levees built larger and larger as erosion increased and periodic floods grew more widespread and destructive. Kidder, an authority on river basin geoarchaeology, has gathered data from the Yellow River excavation sites over the last five summers. He also conducts similar geoarchaeology research along the Mississippi River at a Native American site called Poverty Point in Louisiana. He argues that geoarchaeology — a relatively new science that combines aspects of geology and archaeology — offers the potential to make dramatic contributions to our understanding of how climate change and other large-scale environmental forces are shaping human history. While there are many theories behind the fall of the Western Han Dynasty, Kidder’s research suggests human interaction with the environment played a central role in its demise. In this study, he offers a big-picture explanation for how a complex mix of well-intentioned government policies and technological innovations gradually led the dynasty down a disastrous path of its own making. Map showing historically identified courses of the Yellow River and its historic mega-deltas. The 1938–1947 course evolved after the dykes were destroyed to (unsuccessfully) prevent Japanese forces from advancing across the Central Plains. The Yellow River, he argues, had existed for eons as a relatively calm and stable waterway until large numbers of Chinese farmers began disturbing the fragile environment of the upper river’s Loess Plateau. Built up over the ages by wind-blown sands from the nearby Gobi Desert and Qaidam Basin, the plateau has long boasted some of the world’s most erosion-prone soils. As early as 700 B.C., Chinese authorities were encouraging peasant farmers to move into remote regions of the plateau, citing the need to feed a large and growing population while establishing a buffer of human settlement against the threat of nomadic invaders along its northern border. Construction of The Great Wall swelled populations still further. Meanwhile, new iron-making technologies vastly increased the effectiveness of plows and other farm tools while spurring rapid deforestation of timber used in iron refining. Widespread erosion in the river’s upper regions caused it to carry incredibly heavy loads of sediment downstream where deposits gradually raised the river bed above levees and surrounding fields. Slowly, over thousands of years, human intervention began to have a dramatic impact on the river’s character. Periodic breaches of the levee system led to devastating floods, with some shifting the river’s main channel hundreds of miles from its initial course. A census taken by China in A.D. 2 suggests the area struck by the massive A.D. 14-17 flood was very heavily populated, with an average of 122 people per square kilometer, or approximately 9.5 million people living directly in the flood’s path. “The misery and suffering must have been unimaginable,” Kidder said. Historical accounts indicate that communities hit by the flood were soon in complete disarray, with reports of people resorting to banditry to obtain food and stay alive. By A.D. 20-21, the flood-torn region had become the epicenter of a popular rebellion, one that soon would spell the end of the Western Han Dynasty’s five-century reign of power. While the research offers new insight into Chinese history, it also has interesting implications for modern river management policies around the globe, such as those causing similar flooding problems along the Missouri and Mississippi rivers in the United States.